On an unseasonably warm South Carolina spring morning, Dogwood and Redbud trees are already in bloom along a stretch of concrete driveway, where a fine yellow dust of tree pollen lingers on car hoods parked near the barn ahead. Turning off State Highway 261, a two-lane road where you could go awhile without passing another car, the beauty of green sloping pastureland and acres of fence line on the horizon might fool you into thinking you’re in Kentucky Bluegrass country. While it’s true that many thoroughbred farms have a security gate and sometimes a guard to screen visitors, it’s not until you’re asked to surrender your picture ID and catch a glimpse of the barbed wire ahead that you realize you’re at Wateree Correctional Facility, a medium-security prison located in Rembert, South Carolina. 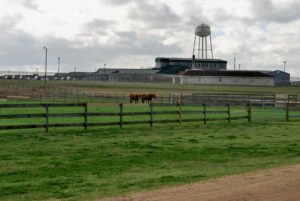 Wateree Correctional Facility is the home of South Carolina Thoroughbred Retirement Foundation’s Seabiscuit Stables, a residence for 29 off track thoroughbreds and the inmates who care for them, and part of the South Carolina Department of Corrections. 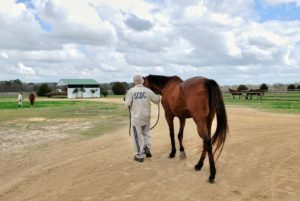 Founded in 2004, the Second Chances program has served hundreds of off track thoroughbreds, who collectively have earned over $1M in purses, and also trained at least 100 inmates to be certified racehorse grooms, according to SC TRF board member and local resident William Cox. Outside, two herds run freely over 100 acres, while inside the immaculately kept barn, two former racehorses are in their stalls to be checked by inmates Tyrone and Raymond , who have become instructors in the Groom Elite program , (www.groomelite.com), which all inmate participants complete before receiving a certificate qualifying them to work as grooms or skilled barn help upon their release. Twenty-year old New York-bred Connection (by Mr. Prospector son Kayrawan, out of Interrupta, by Stop the Music) broke his maiden as a 3-year-old at first asking at Belmont in 2001, and went on to win again in allowance company at four at Aqueduct. 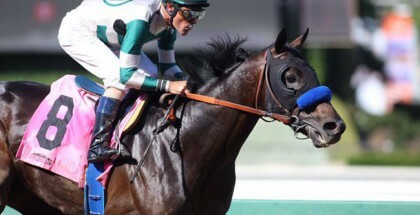 He finished in the money 9 times in 21 starts before retiring at age six with lifetime earnings of $115,000. Louisiana-bred My Decision (rowning Decision-Suzy Blackhawk by Stutz Blackhawk), now 18, was winless in 24 starts with lifetime earnings of less than $8,000. “Students were afraid of him when he first got here,” Tyrone explains. 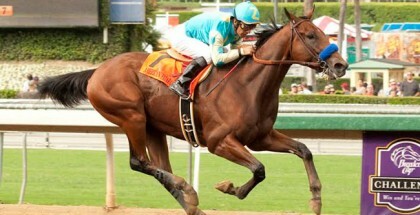 The bay gelding has since mellowed and appears to be happy in his permanent home. Each day, Tyrone and Raymond supervise inmates learning to be grooms as they clean stalls, feed all 29 head, clean their feet, take each horse’s pulse, temperature and respiration, check for dehydration and perform regular barn chores. It’s not an exaggeration to say that the cleanliness of their barn rivals that of Hall of Fame conditioner D Wayne Lukas’s. Inmates work from 7 a.m. to 3 p.m. seven days a week and they spend an additional four to six hours in classroom instruction. Additionally, they study on their own to pass a total of eleven tests, which include everything from conformation and basic equine anatomy to bandaging, tack, pre- and post-race handling, equine illnesses and injuries, as well as a special unit on care of the retired racehorse. Practical handling of horses and work in the round pen is also included. Zak is typical of Second Chances graduates in that he credits the program for giving him skills and confidence, which increase his employability. 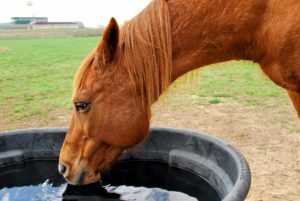 Zak says he worked at a local horse farm immediately upon his release, but has since enrolled full time at a technical college to pursue a degree in Computer Systems Management. Like many in the racing business, Zak also experienced firsthand the emotional attachment and pain that comes from losing his favorite horse, Accelerant, a son of Candy Stripes and a black-type winner, due to colic at the age of 18. Former inmate Chris G. echoes that sentiment. Immediately upon his release from Wateree, Chris went to work at a hunter/jumper barn, traveling the show circuit in the southeast. He remembers the first time he got a horse to yield to him in a round pen. “That big creature trusted somebody like me when I didn’t even trust myself,” Chris recalled. Today, back in the barn, inmate Tyrone prepares to lead an upcoming classroom session. Six years ago, he was a junior inmate with no horse experience, just like some of his students now. 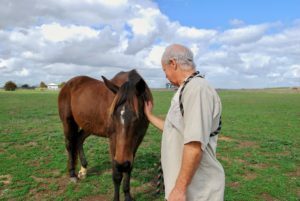 Inmate Raymond, also an instructor and participant in Second Chances for the past two years, is one of few with prior horse experience. He says he had four pleasure horses on ten acres, but “lost everything” when he came to Wateree. 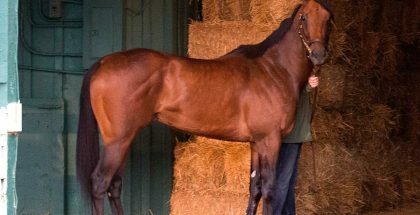 What Raymond says he likes most is, “learning the horses’ personalities.” His favorites are some who have become harder to handle, like 24-year-old Florida-bred On a Crusade (Crusader Sword – Deputy’s Mistress, byDeputy Minister), an allowance winner who broke his maiden at first asking in 1995 at Monmouth Park, and who finished in the money 20 times over 61 starts for total earnings of $95,000, mostly in claiming ranks. 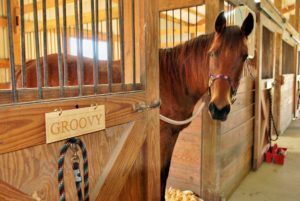 Like many OTTB rescue facilities, the Wateree program relies heavily on individual donations. Although part of the national TRF organization, Wateree has been largely self-sufficient for over fifteen years, generating almost all of its own funding. Recently the program experienced some setbacks, including the loss of matching funds from the state of South Carolina and the untimely death of a major donor. 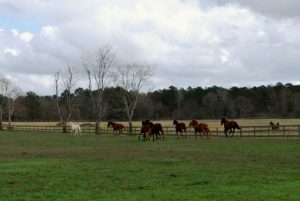 The program strives to be as efficient as possible, growing and baling its own hay, using labor and machinery from the SC Department of Corrections to spread fertilizer and limiting farrier services to problems other than routine trimming, which is done by inmates, and training more experienced inmates to teach others. In addition to serving on the SCTRF board, Cox has shouldered responsibility for farm management, pointing out that the organization pays no salaries and relies entirely on volunteers. “One hundred percent of our funding goes to horse and facilities maintenance,” Cox explains. Cox is grateful to the South Carolina Department of Corrections, who has donated land, labor and staff since the program’s inception. As Raymond and Tyrone lead Connection and My Decision down the sun-drenched dirt path from the barn to rejoin the herd grazing calmly under a sky marbled with clouds, it’s easy to see that, for today at least, both man and horse seem to be on the right road. *Make a donation in any amount. 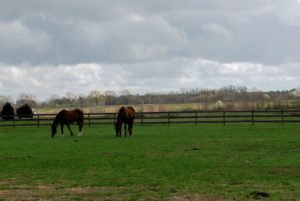 Funds will be used to house more horses, allow more inmates to participate, enable Dr. McLellan to visit the facility more frequently, get fences mended , and provide marketing outreach to encourage adoptions and increased volunteer participation. * Donations of barn and horse supplies, including horse books, magazines and DVDs are always appreciated. 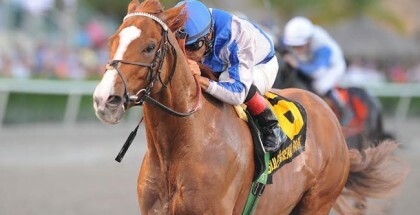 *If you’re a trainer or owner looking for highly trained grooms, consider hiring a Second Chances program grad.